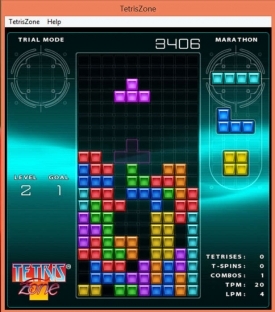 "Play the classic game of Tetris on your PC today!" In the mood for some good 'ole classic arcade fun! You'll have a blast with Tetris Zone. It is a beautiful reincarnation of the classic Tetris game. It works on most versions of Windows - even dated versions like Windows 2000. It's fun for you, all your friends, and family. Even kids can get into it. After all that is the best time to start playing it. Warning: Tetris Zone is a very addictive game and should only be played when your priorities have been taken care of. Or they won't be.